True collaboration takes time, commitment and consistency. As we close out the third year of working together as Innovate78, we are excited to see projects gaining momentum, business relationships strengthening, and city politicians and staff working together to improve the economic wellbeing for residents and businesses in each of our five cities. 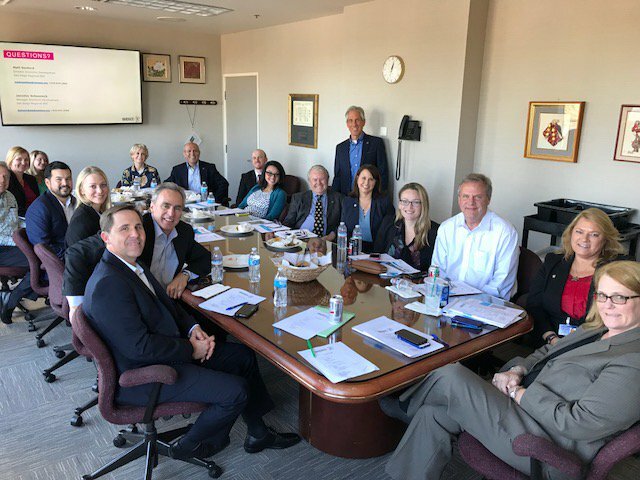 In early December, the Innovate78 team met to review our 2017 success stories and to look ahead toward our 2018 priorities. In 2017, Innovate78 directly supported more than 29 individual company projects (including facilitating introductions, holding collaboration meetings and executing business support services), eight California Competes Awards, which will save businesses $6.1M in state taxes over the next five years and two MetroConnect companies (startups granted an international expansion award through World Trade Center San Diego). We hosted an exploratory mission to Tijuana to better understand the cross border dynamic and resources that Maquiladoras bring, five talent focused events including Tacos and Tech in Silicon Valley to attract talent to San Diego, an executive roundtable to support the development of CSU San Marcos’ Engineering School and three Link2 Tech programs which expose students to career opportunities in high-demand fields. We also released a comprehensive tech study for the 78 Corridor, which shed light on the 78 Corridor’s growing tech ecosystem. To better inform strategy and tactics, San Diego Regional EDC’s research team continuously gathers and updates key economic data about the region through its online dashboard. This data provides indicators such as unemployment, median age, average home price, income and even average commute times for residents. The region has a healthy unemployment with a rate of only 3.1%, down .8 percent from the previous year1, an increase in median income $68,176 to $74,0242, and an increase in annual patents filed with each of the cities: 862 up from 8093. On top of all that, the average commute time is only 28 minutes, an alluring prospect for employees bearing one hour plus commutes in other cities like Los Angeles, San Francisco and New York. See all the data points here. In addition to the achievements of the Innovate78 initiative within each of the five cities, there were several other San Diego Regional EDC activities that provided benefit to the businesses and people that call North County home. Innovate78 businesses participated in Manufacturing Day, a London Trade Mission and a Life Sciences Trek that invited master’s and PhD students from around the country to visit tech and life sciences companies in San Diego in an effort to lure talent to the region with more than beaches and sunshine. 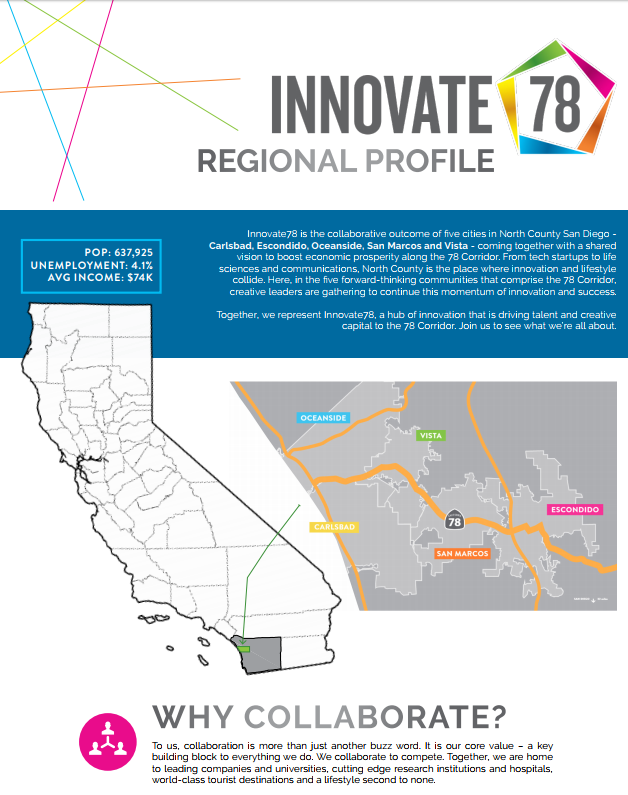 The purpose of Innovate78 is to create a collaborative environment among community leaders, businesses and residents to achieve long term economic prosperity in each of the five cities. In 2018, this collaboration will continue to execute strategies that support long-term economic growth for businesses, education institutions, organizations and talent living in each of the five cities. The focus of the coming year’s activities includes business and talent retention, expansion and attraction through an in-depth look at the cities’ startup community, small businesses and talent pipeline management. If you would like to stay up-to-date on Innovate78 news and activities, please subscribe to our newsletter and follow Innovate78 on Twitter. 1 Unemployment was 3.1% in November 2017 and 3.8% in November 2016. Source: CA EDD, November 2017. 2 Median Income source: ACS, 1 year estimates, 2015-2016. 3 Patent source: USPTO, 2015-2016.